Welcome to Hostel El Encuentro, a small eco-hostel / hotel offering resort-like luxury at backpacker's prices. 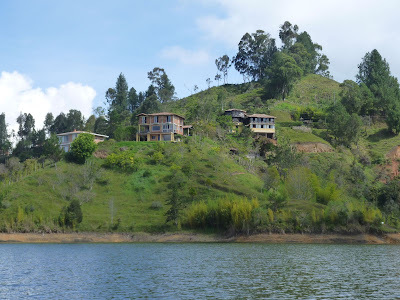 Situated on a spacious private peninsula overlooking the town of Guatapé, its gorgeous lake, and the famous El Peñon rock, our hostel offers guests the chance to get away from the noise and pollution of city life, while still providing easily walkable access to the town and the many attractions and activities in the area. Check out our Activities page for more information on the many exciting things to see and do in the area. Because we are a small hostel, advance reservations are recommended. Click here for reservation information.